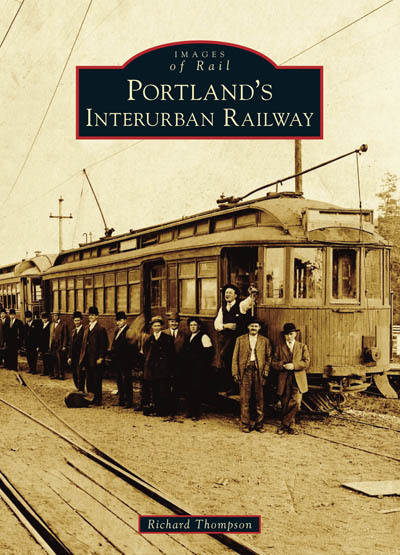 t the end of the 19th century, Portland led the nation in the development of interurban electric railways. The city became the hub of an electric rail network that spread theroughout the Willamette Valley. This is the story of the pioneering local railways that started it all as they built south along the Willamette River to Oregon City and east to Estacada and Bull Run in the foothills of the Cascade Mountains. More than 200 historic images illustrate Portland's Interuban Railway, from its rudimentary beginnings through the peak years, when passengers road aboard the finest examples of the car builders' art, to the sudden end in 1958. Historian Richard Thompson may not have grown up to be a museum director, librarian, or trolley coordinator had it not been for the influence of his grandmother, who took him along for rides on that last interurban.